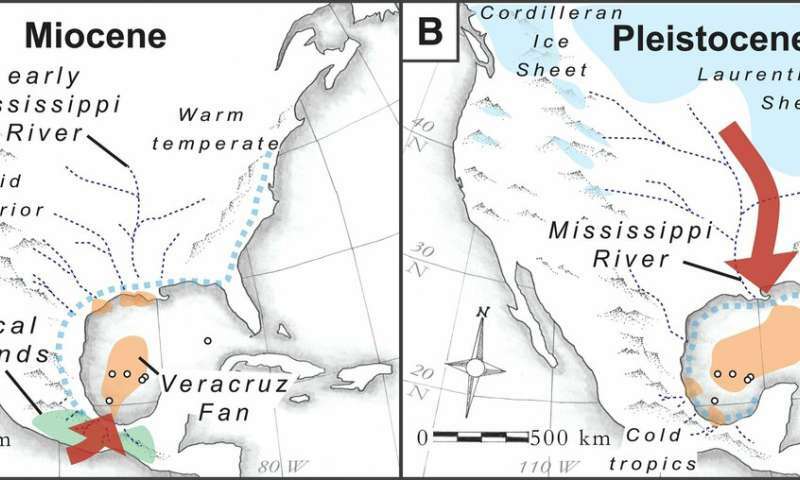 Scenarios for sediment supply to the western Gulf of Mexico in the Miocene (A) and Pleistocene (B.) Sediment-source area for Miocene is shown in green; Laurentide and Cordilleran ice sheets and Rocky Mountain glaciers are in blue. Open circles are Deep Sea Drilling Project (DSDP) study sites. Credit: Hessler et al. Based on the composition of the sediments, the researchers were able to determine that the primary supply of sediments during the middle-to-late Miocene came from rivers in southern Mexico. This came as a surprise because of the rivers' relatively small catchment—an area in the tropical highlands of Mexico about 300-by-500-square kilometers, or about the size of Illinois. However, the sediments revealed that what the area lacked in size it made up for with highly erodible conditions, including a wet climate and tectonic activity such as uplifting mountains and volcanoes. "All this information about provenance, and how things interacted at one time or another, or climate—it's all contained in this stratigraphic archive," said Covault. "It just takes a couple people to interrogate the heck out of it and put together a really interesting story that has implications beyond the Gulf of Mexico, for other places that might be subjected to climate change."